Journey to the Past: Fast or Slow? Me: Hi, I'd like to buy IDR 100,000 worth of gas, please. Attendant: Sure. Would you like it fast or slow? Me: Hah? What's the difference? 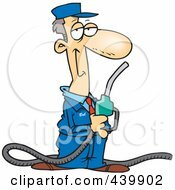 Attendant: Well, we have this technology that makes it faster to fill up gas. But some people complained that they don't get their money's worth, because it takes less time. So we can slow it down if you like. Me: But the volume is the same? Attendant: Yup. No difference whatsoever. Just fast or slow. I cannot believe this is an issue.